← Who stuck the sticker? We love avocados, especially as we have a mostly vegetarian diet and they provide so much goodness. But unless you can get hold of a local supply, or manage to swipe one off a tree as you pass by in the car, they remain a high-priced luxury item. Quite impossible to grow ourselves as they need a lot of water and they are simply not hardy enough to withstand the Foggie climate. There are two main varieties of avocado, the ‘Fuerte’ – smooth skin and green with pale spots or dots, and the ‘Hass’ – textured and knobbly, bright green/brown-green/nearly black purple. The Hass is the most popular type. Admired for the beauty of its evergreen foliage and deep-green pear-shaped fruit, the avocado was originally grown decoratively in Spanish monasteries and palace gardens. But, unlike tomatoes, potatoes and other foods from the New World, they took a while to catch on in Spain. 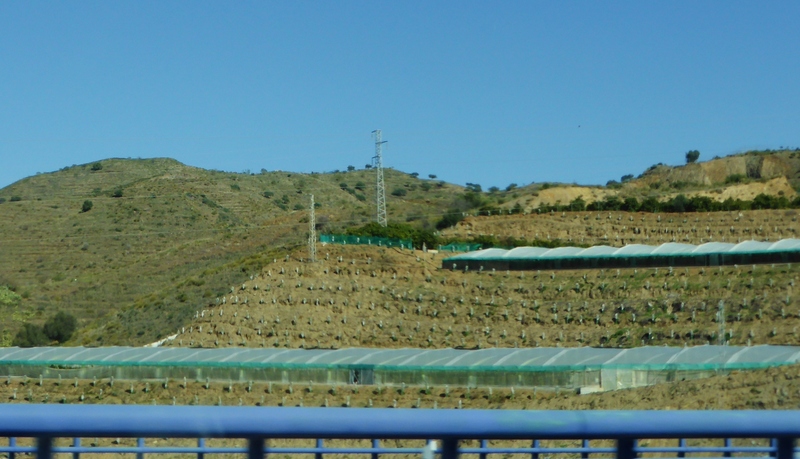 The first avocado plantations were established in the subtropical areas around Almuñecar on Granada’s coast in the early 1960s and they have rapidly grown in popularity ever since, recently acquiring the status of a ‘superfood’. 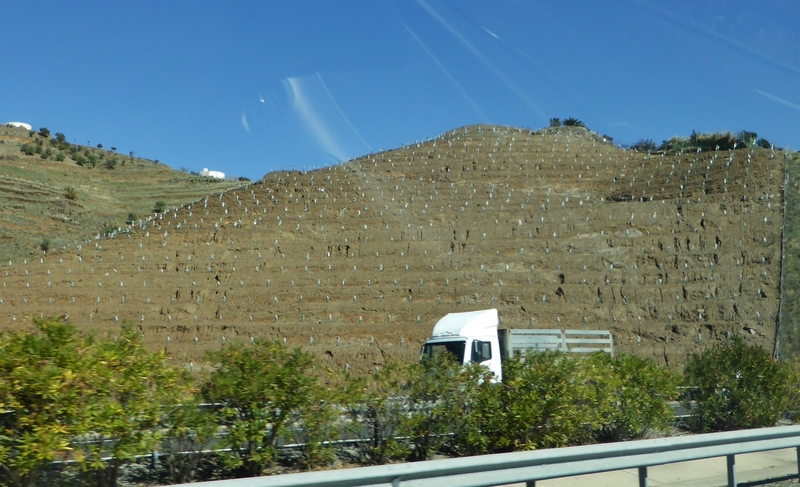 It’s impossible not to notice how the landscape around the Málaga area has been changing in front of our eyes with the emergence of more and more avocado trees that dot and stripe the steep hills in serried ranks of upright green blobs, many of them currently shrink-wrapped against winter’s chill. Off on a bit of a tangent: a particular gripe of mine is that the coast road has been blighted for years by polytunnels and one wonders whether the growers need planning permission for such ugliness. Around here we are used to seeing neat rows of vines, olive trees and almond trees – the almond blossom has been spectacular this year – but last year there was definitely increased digger activity. But instead of clearing platforms for building yet more speculative houses with mandatory swimming pool, the diggers have been out in force at impossible and scary inclines to claim back land from Mother Nature. 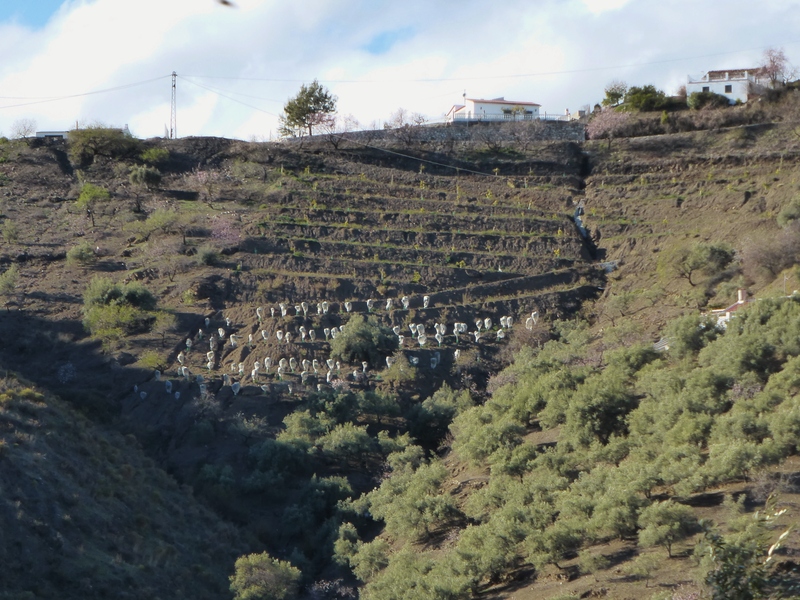 Huge swathes of hillside have now been terraced and planted on quite a large scale. My curiosity aroused, I decided to do a bit of quick research. It certainly seems apparent that because of the moratorium on new building and renovations and the recession (I wonder which came first here in Spain? ), the local people are going back to what they did best – growing crops. There has apparently been an upsurge in demand for allotments in the more built-up areas. It would make sense that, as in the case of many other projects in the past (especially civil engineering and ‘amenity’ ones), the government is gaining funding from their best mates in Brussels to step up avocado cultivation. Such increased production couldn’t have anything to do with the US market finally unblocking the import of Spanish avocados, could it? In January this year the US Animal and Plant Health Inspection Service (APHIS) finally approved the import of avocados from mainland Spain, helped no doubt by the introduction of a ‘phytosanitary protocol’ to minimise the risk of spreading the dreaded Mediterranean fruit fly (ceratitis capitata) and avocados other than the Hass variety ‘will be treated before departure or upon arrival in the US’. Paradoxically, although the US ranks as one of the world’s top avocado producers, it is also the largest import market for avocados. The gap between US imports and exports has widened substantially – in 2008-2010 average annual imports were nearly $622M, compared to average annual exports of less than $16 million. US consumption of avocados has risen substantially – in 2010, consumption had reached 1.86kg per capita, nearly doubling what it was in 2000. Spain expects to export 260M tonnes of fresh avocado to the United States a year, which according to APHIS this equates to 0.07% of net U.S. imports of the fruit or 0.05% of the net U.S. supply (info from freshfruitportal.com). Spain is far and away Europe’s largest producer of avocados, the main subtropical crop grown in Spain, with 60,000 – 80,000 tons produced across 10,470 hectares. Although the commercialisation of Spanish-grown avocados is relatively new, Spain has been cultivating avocados since they were ‘discovered’ in Mexico by the conquistadores around 1520. The Spanish name, aguacate, comes from the word the Aztecs called the fruit, from the Nahuatl name, ahuacatl, meaning ‘testicle tree’ for the way some varieties of the tree bear their heavy fruit in pairs. It’s always good to see and hear of success stories like the avocado. 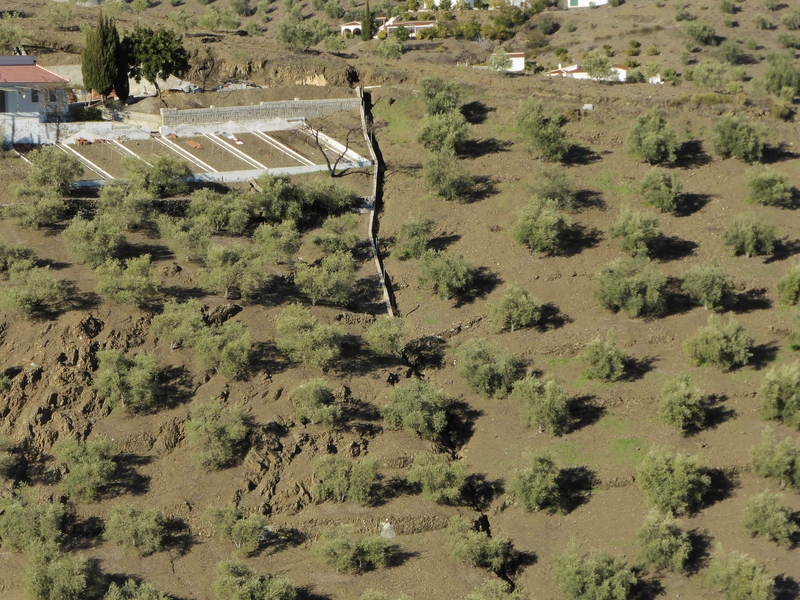 The Olive Press Magazine reports that while most industries in Andalucia are feeling the pinch of the economic crisis, agro-food is one area where business is positively booming. Of the 125 agro-food factories in Andalucia, a third are in Malaga. Thanks to successful production of olive oil, meats, vegetables, fruits, cheeses, seeds and fish, food factories have been able to substantially increase their overseas sales and create much-needed new jobs, while other industries have failed to stay afloat. One company alone (exporting lychees, avocados, mangoes and kumquats) is looking to triple its turnover this year. 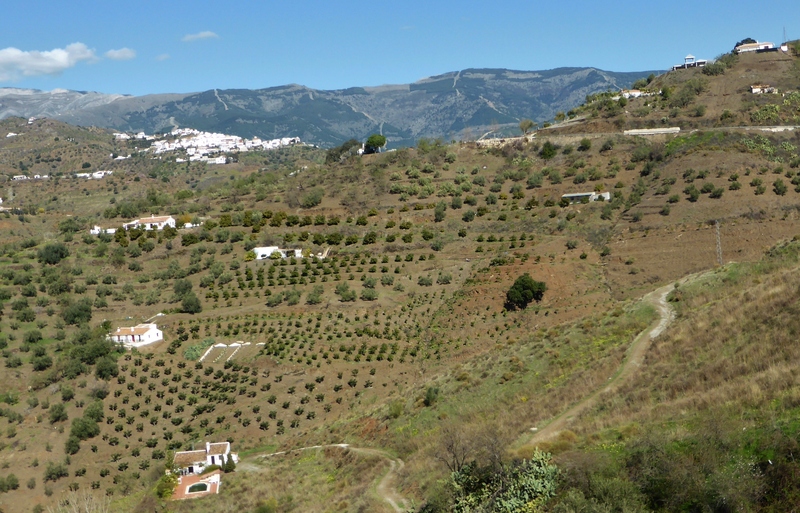 No wonder avocados are everywhere – Málaga province supplies 70% of total avocado production. But watch out, there are thieves about! 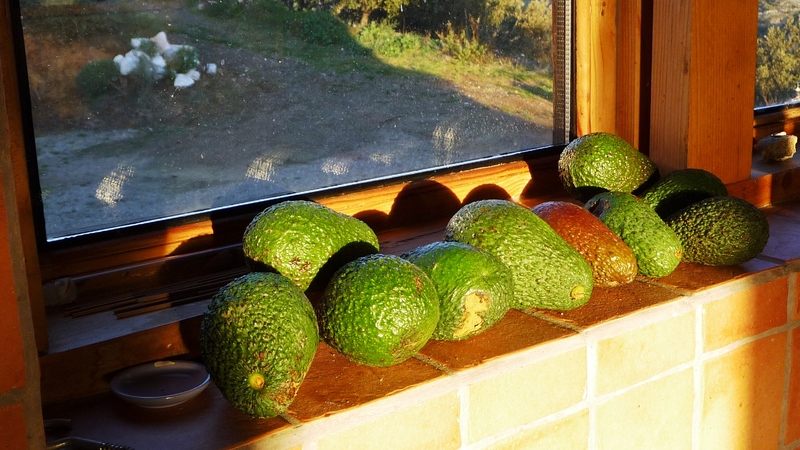 Avocado rustling is on the increase, not just young trees being nabbed in the dead of the night, but ‘at least 10 tons’ of harvested avocados was reported as taken in raids on farms in Nerja, Frigiliana and Torrox during last Christmas!